A Carrotmob uses a “carrot” instead of a “stick” to change business behaviour. It’s a form of consumer activism where a community buys from one company in a short time period to reward that business’s commitment to making environmentally and socially responsible changes. In return for the increase in revenue on that day, the business agrees to invest a percentage of the profits into improving their environmental and social impact. Carrotmob Cape Town is driven by the Cape Town Climate Change Coalition (CTCCC) consisting of more than 30 partner organisations and is part of the Climate Smart Cape Town (CSCT) campaign. Campaign coordinator, Julia Karl, has worked with the Carrotmob initiator, American Brent Schulkin, and has successfully taken part in such events in Germany. The partners of the coalition are committed to knowledge sharing, capacity building and awareness with respect to climate change. The City’s Mayoral Committee Member for Economic, Environmental and Spatial Planning, Alderman Belinda Walker, believes that this unique event is a win-win proposition for both consumers and businesses. “The Carrotmob business partner will benefit from increased sales, free marketing and an enhanced reputation, whilst consumers get to know a new, positive form of activism and enjoy a great experience. “Society wins by way of the positive action taken by the business as well as increased awareness of environmental and social issues. If you are a citizen that is concerned about social and environmental issues but feel that existing methods to enact change are ineffective, impractical or confrontational, then Carrotmob is for you,” said Ald. Walker. Cleon and Kate Romano, the owners of Maria’s Café, have pledged 100% of the Carrotmob proceeds to implementing their commitments. Purchase of green electricity certificates. “Join us for a drink, great food and music. You will be able to pick up information on climate change and find out how you can make a difference. If you walk, cycle or take public transport to Maria’s – you will be rewarded”. 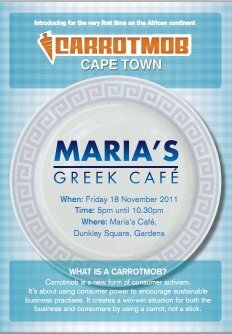 This Carrotmob is a project of Climate Smart Cape Town and Lead SA – 567 Cape Talk. What is the Cape Town Climate Change Coalition? The Cape Town Climate Change Coalition (CTCCC) represents a loose alliance of organisations and partners who came together in June 2010 to support Cape Town’s bid to host COP 17. Even though the bid was not successful and COP17 will be hosted in Durban, the partners remain committed to continuing the strong network and the resultant benefits such as knowledge sharing and capacity building with respect to climate change. The partners have resolved to utilise the energy and momentum from South Africa’s hosting of the Climate Change Convention Conference of Parties (COP17) from 28 November until 9 December 2011 to build Cape Town into a city which is more resilient and resource efficient. All partners have signed a charter that commits them to a programme that helps to reduce carbon emissions in Cape Town, to mitigate and especially to adapt to the impacts of climate change, protecting and enhancing the natural, cultural, social and economic environment. The coalition currently consists of 30 partner organisations. The Climate Smart Cape Town (CSCT) Campaign is a project of the Coalition. The campaign creates awareness of how climate change will affect all who live in Cape Town and the region and encourages people to take action to reduce the risk.